Topics: Airport Info, Airlines, Hotels & Reservations, Golf Hotel Abidjan, Hotel Ivoire Abidjan, and Hotel Pullman Abidjan. 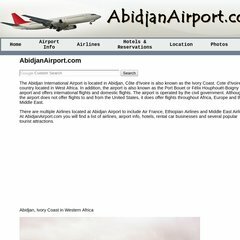 abidjanairport.com Airport in Abidjan - International & Domestic Airlines - Charters .. It is hosted by Theplanet.com Internet Services Inc (Texas, Houston,) using Apache web server. Its IP Number is 74.53.89.19. It has 2 DNS records, ns659.websitewelcome.com, and ns660.websitewelcome.com. PING (74.53.89.19) 56(84) bytes of data.